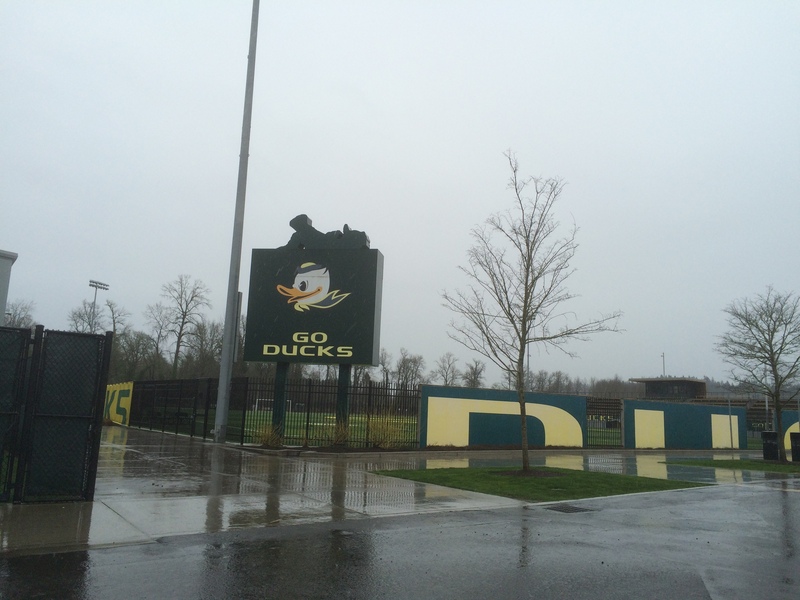 The University “Ducks” are everywhere. The Yellow and Green made me feel right at home. The University of Oregon has the Ducks, Oregon State University has the Beavers, and when Kathy and I arrived at the District 36R Lions Convention, we brought the Bison from North Dakota! From touchdown to wheels-up, our time in Oregon was informative and filled with positive memories. Our host for the weekend was Past International Director Ed Gear (1997-1999). What a great guy: Gracious, attentive, supportive, and accommodating throughout our stay; and we so appreciated getting to know him and Sandy. We found that we have many things in common with PID Ed, including in USA/Canada Forums and other leadership development activities. As we toured Eugene and traveled up Interstate 5 to Corvallis, we talked about a wide range of topics and learned about the variety of Oregon’s specialties that have gained popularity: crafted beers, wine, cheese, and organic farm produce. Kathy especially enjoyed Oregon’s “hoppyness.” We appreciated visiting with PID Ed and other Lions who have served our association in leadership positions because their insight helps us to be better informed about issues facing our association as we move forward into our second century of service. ID Robert, Kathy, and PID Ed at Guest House. Guest House in Eugene where primarily young parents and families stay when their premature babies are cared for at the Neo-Natal Intensive Care Unit at Peace Health Sacred Heart Medical hospital. We met the director of Guest House and toured the facility. The guest suites were homey and the special features (deck overlooking the waterway, kitchen, and common areas) made staying there less stressful for the residents. We experienced a very poignant moment while standing in one of the public spaces as a young man walked by us into the kitchen. PID Ed and the director were telling us about the on-going support of the Eugene Downtown Lions for Guest House, and quietly the young man turned around and asked: “Who are you?” Ed replied: “We are Lions.” Choked with emotion, he could only say, “Thank you. Thank you. Thank you. You don’t know what it means for us to be able to stay here. Thank you.” Talk about moments when you realize the impact of what it means to be a Lion. 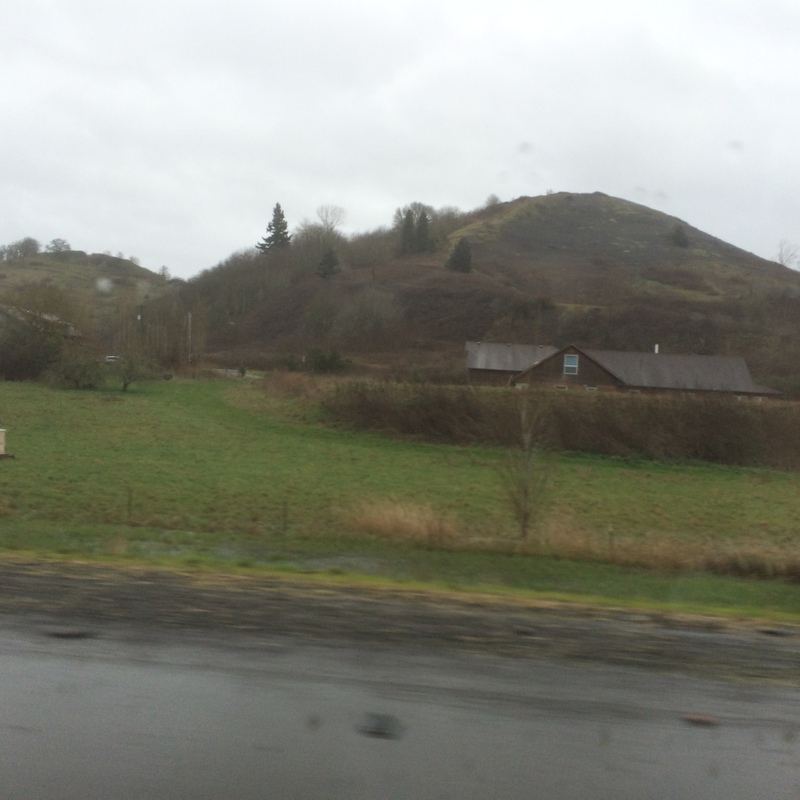 Countryside en route from Eugene to Corvallis, OR. As we traveled up the Willamette Valley, we learned that it is nestled between the coast and the Cascade Mountains. The valley is largely agricultural and grazing land. While the weather was overcast with occasional showers, we enjoyed the mild temperature (in contrast to our sub-zero Red River Valley) and green landscape . ID Robert and Kathy at convention site. The convention was held in the Alumni Center at Oregon State University. The facilities were perfect for displays, storyboards about individual clubs’ histories (a great idea as we approach the Centennial of LCI! ), and breakout sessions. We observed the “first timer” session that really made the newcomers to the convention feel welcomed. A group of Leos were in attendance and I was so pleased to learn about their activities and enthusiasm about service. Another session led by Doug Thompson (Oregon Sight and Hearing Foundation) focused on vision screening and the impact Oregon Lions have had on 125,000 children in Oregon over this past year. 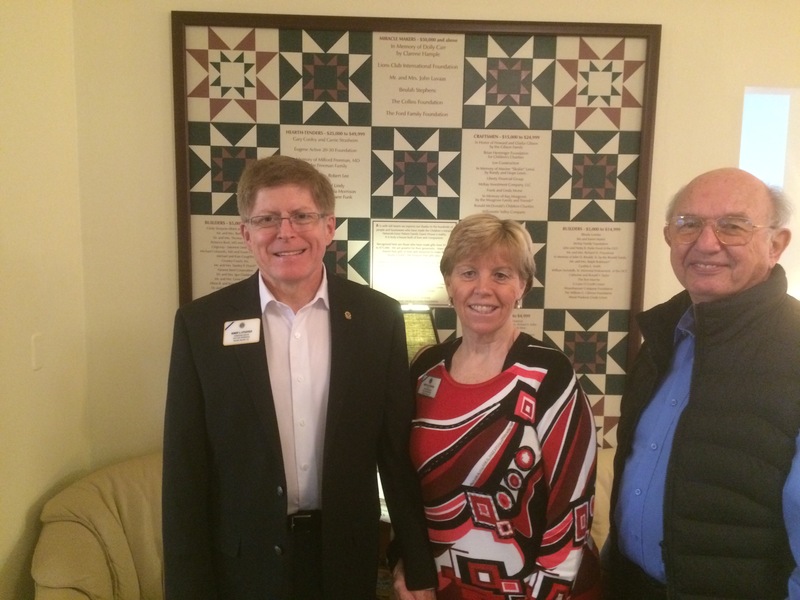 It made me proud to share that North Dakota Lions have been expanding their vision screening efforts through the efforts of the Lions Foundation of North Dakota and LCIF. ID Robert ready for session on improving communication. 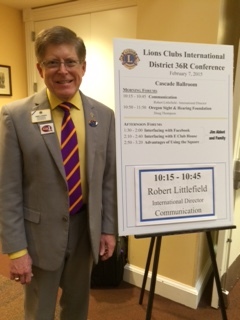 I was asked to lead a session on improving communication, so I helped everyone develop “a 30-second elevator speech” as a way to explain what Lions Clubs International is, what Lions do, and an invitation for potential to join. The “Speak Up For Service!” theme is essential as we spread the word and “Just Ask” potential members to join our great association! Another highlight for me was inducting four new Lions: James Carey, Jerri Carey, Ross Isbell, and Jadie Wright accepted membership. This brings the number of Lions I have inducted during official visits to 19! Newest Lion Jadie Wright was sponsored by her grandmother. Not only did their sponsors pledge to help them become active members of their respective clubs, the entire assembly stood and pledged to help them become the best Lions they could be. 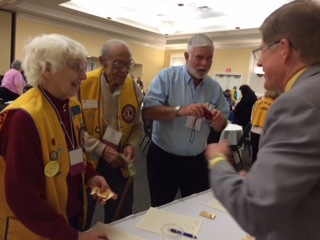 Being able to represent the International Board and induct new members into Lionism is one of the most enjoyable aspects of traveling and representing our association. Lion Paulette and PCC “Mo” Jaffer (couple at left) met at UND in North Dakota. They donated to the Measles Initiative and received a special gift from ND at final session. 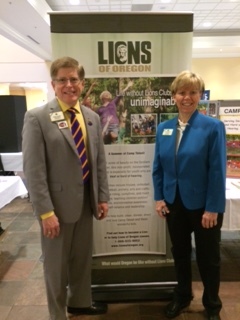 Kathy and I are also pleased to report that after hearing our request for District 36R Lions to support the One Shot, One Life Measles Initiative of the Lions Clubs International Foundation, we collected $500.00. With the GAVI Foundation dollar-for-dollar match, over 1,000 lives will be prevented from contracting the deadly measles virus. What a precious gift from the Oregonian Lions! Thank you for supporting this important international “One Shot, One Life” initiative. While our time in Corvallis was short, we were made to feel welcomed and appreciated. This is the story of Lionism, as one of the convention delegates remarked: “Through Lionism, you always have at least 20 good friends everywhere you go.” That is so true. 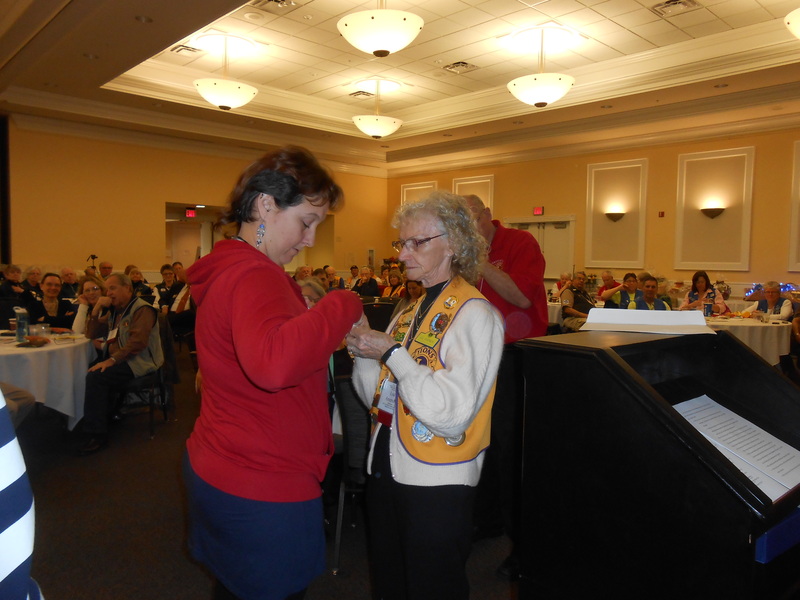 Ahem — and please share the number of Lions you inducted at the North Dakota State University Campus Lions Club last Wednesday. Your example keeps them roaring!